Blithely ignoring the worldwide context, which includes the intimate connection between jihadism, and Islamic Jew-hatred, Tuesday, April 9th, the House Judiciary Committee held a hearing entitled, “Hate Crimes and the Rise of White Nationalism.” Much to the chagrin of the majority Democrats who organized the hearing, one witness, Zionist Organization of America President Morton Klein, refused to abide their willful blindness. Mr. Klein emphasized the disproportionate occurrence of hate crimes against Jews in America—a consistent phenomenon for over two decades based upon hard FBI data (1996–2017). Indeed, despite the Committee’s hand-wringing about “Islamophobia”—notwithstanding 53 jihadist attacks which have caused 158 deaths in the U.S., since the cataclysmic 9/11/2001 jihad carnage, and zero, remotely comparable depredations by Jews—hate crime rates targeting Jews, between 2015 and 2017, remained 2.2 to 3.1-fold higher, relative to the rates of hate crimes against Muslims. Mr. Klein’s greatest “offense,” however, was to expose the moral perversity of focusing on “Islamophobia,” or worse still equating it with Antisemitism, when Jews are being subjected to a global pandemic of Muslim Jew-hatred, which includes the attitudes of U.S. Muslims. [The] Koran describes the Jews with their own particular degenerate characteristics, i.e. killing the prophets of Allah [see Koran 2:61/ 3:112 ], corrupting His words by putting them in the wrong places, consuming the people’s wealth frivolously [4:161], refusal to distance themselves from the evil they do [3:120; 5:79], and other ugly characteristics caused by their deep-rooted (lascivious) envy [2:109]…only a minority of the Jews keep their word…[A]ll Jews are not the same. The good ones become Muslims [Koran 3:113], the bad ones do not. More ominously, as Klein noted in his opening statement, Tantawi’s exhaustive modern analysis of Islam’s defining, canonical sources concluded by sanctioning bigoted—even violent—Muslim behaviors towards Jews. As Grand Imam of Al-Azhar, Tantawi’s public statements on “dialogue” (January 1998) with Jews, the Jews as “enemies of Allah, descendants of apes and pigs” (April 2002; from Koran 5:60), and the legitimacy of homicide bombing of Jews (April 2002), made his personal Muslim Jew-hatred eminently clear. Tantawi’s comments on dialogue, which were issued shortly after he met with Israel’s Chief Rabbi, Israel Meir Lau, in Cairo, on December 15, 1997, re-affirmed his ongoing commitment to the views expressed in “Jews in The Koran and The Traditions”. 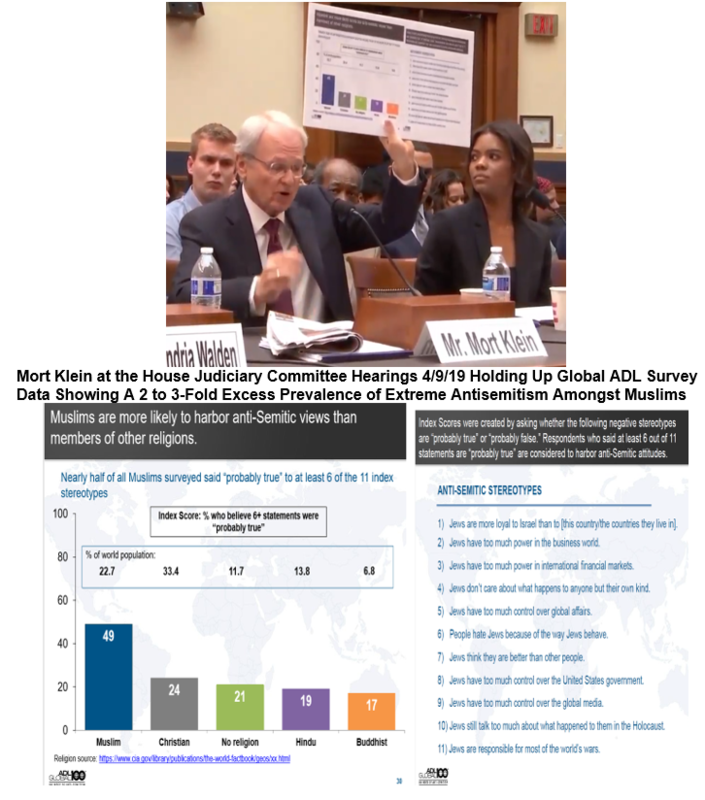 Kudos to Mort Klein for courageously shattering the prevailing, enforced silence of our national political class regarding the global pandemic of Muslim Jew-hatred, rooted in mainstream Islam. It remains an open question whether being informed will prompt these timorous souls to overcome their “Islamophobia phobia,” and forthrightly acknowledge and confront this ugly problem.